Set out a cascading fruit centerpiece at your next celebration and you're sure to hear plenty of compliments from guests. Here are the basic instructions for making one. You'll find everything you need at your local crafts and grocery stores. Once you get the basics down, you can use other fruits and flowers and adjust the size of the centerpiece to fit your needs. Make a stable base and the rest of the centerpiece will be much easier. This is the most important part. Cover the Styrofoam rounds in aluminum foil and stack them on top of each other, with the smallest at the top. You don't want the rounds centered on each other, though. Line them all up to form an off-center pyramid. The more steep side will be the back and the more gently sloped side will be the front. Put the 8" wooden dowel through the place where all the Styrofoam rounds come together (the more steep side). 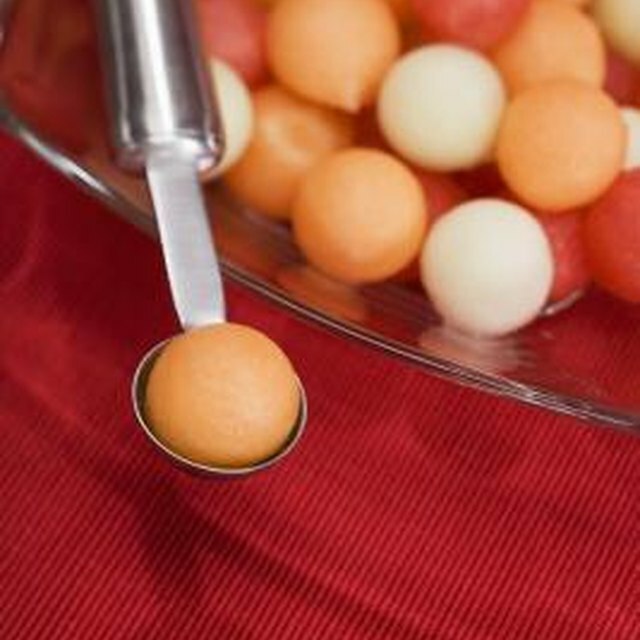 Put the 4" dowel in the lower four rounds only, to add stability to your cascading fruit centerpiece. Place this Styrofoam pyramid on a serving platter that's large enough so you have room around the bottom of the centerpiece to place the pineapple. Prepare the fruit. Cut the top quarter of the pineapple off, keeping it intact to use as your centerpiece topper later. Cut off the bottom third of the pineapple (you can use a fancy scalloped pattern to add interest) and clean it out, leaving a 1/2" shell. Cut the middle of the pineapple into chunks and set aside for later. Cut the grapefruit, orange and lemon in half (if you used a scalloped pattern with the pineapple, repeat it here). Clean out one half of each fruit. These cleaned out fruit halves will be your cups to hold fruit dip. Construct your cascading fruit centerpiece. Put the dip cups in place first. The pineapple goes directly on the serving platter, at the bottom of your pyramid in front of the gently sloped side. Put the grapefruit cup on the 10" round level, the orange cup on the 8" round level and the lemon on the 6" round level. Place the top of the pineapple that you saved earlier on the very top. Using greening pins, attach bunches of fruit to the Styrofoam layers, filling in around the dip cups. Fill in smaller areas with strawberries, chunks of pineapple and flowers. Don't forget to fill in the more steep side of the pyramid, too. Once that's done, fill the dip cups. Adjust the height of your centerpiece by adding larger Styrofoam rounds (12") to the bottom or by taking out the 6" rounds. Doing it this way will keep your cascading fruit centerpiece stable. Using the same base, you can choose any fruits you'd like to fill in around the dip cups. Just be careful not to use fruit that turns brown quickly after it's cut, like apples, pears or bananas. Make your cascading fruit centerpiece even more special by using chocolate-dipped strawberries. This centerpiece takes about 3 hours to create and can be expensive because it uses so much fruit. Kate Aldrich is a professional copywriter with over 10 years of writing experience. She graduated from Boston College with a Bachelor of Arts in communications in 1996, and has written professionally for a variety of companies. She currently writes full time for a large cookware company and does freelance work part time.